This is a bit more polished. 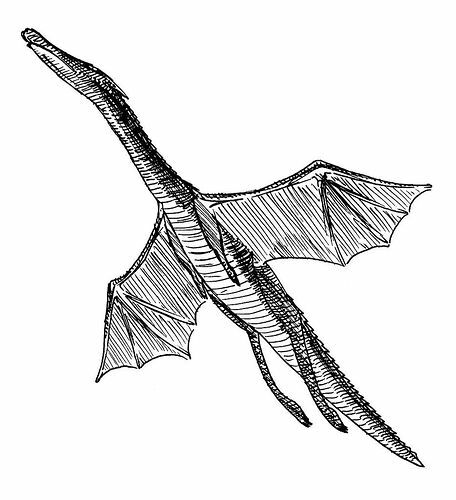 Notice the careful cross-hatching on the body of the dragon. There’s a literalness to this rendering that I quite like. I mentioned before that I never was much for sword and sorcery stuff., but dragons are fun to draw. Chinese dragons (among others) are generally seen as benevolent, whereas European dragons are usually malevolent. However, malevolent dragons are not restricted to Europe, and also occur in Persian mythology (see Azhi Dahaka) and other cultures. The malevolent dragon is a prominent figure in Christian myth and iconography. Some Catholic Saints are depicted in the act of killing a dragon: for instance, Saint George, or, in Italy, Saint Mercurialis, who was the first bishop of the city of Forlì. Dragons are often held to have major spiritual significance in various cultures around the world. One example of them in religion would be some biblical references that seem to hint that the dragon is a type of archangel, one of which by the name of Lucifer, rebelled against God to become known as the seven-headed red dragon called Satan. Some take this as a sign that dragons are an evil force, however other parts of the Christian Scriptures (depending on the version) seem to indicate that God created multiple dragons, not all of whom rebelled. In many oriental cultures, they were, and in some cultures still are, a being to be revered, and were representative of the primal forces of nature and the universe. I like dragons. I’m reminded of the significance of the dragon in the film _Excalibur_. I really like that movie. I wish it were less violent and sexual than it is, but I suppose as a powerful myth, it does need such *substance* to “flesh out” its messages. Given that my middle name is “Arthur,” I was probably drawn a bit to Arthurian Legends. Mage, a comic series by Matt Wagner, was one such legend. I remember reading it (heh) religiously. Such beautiful work in that first series. I distinctly remember reading it during a break at my driver’s ed classes. The comics shop was just 2 blocks away and I devoured “Mage” for its’ contemporary and cryptic retelling of the Arthur saga. Joe Crawford blogged this at 9:29am in 2005 in July. The 27th was a Wednesday. You are reading this 14 years later. Comment. There are no comments Tweet. Send email. It has hashtags→ drawings memories .